A while ago I had spent a couple of hours to set up my Nuke scripting environment. There were only a few things that need to be taken care of. Namely, those were setting up python environment, setting PySide2 working (no kidding), and using Nuke as a module. Yeah, it seems easy; however, it managed to waste a good amount of my time. So here I will share how I set up Nuke scripting environment. Firstly, I always create a new virtual environment whenever I work on a new project. So I created a python2 virtual environment dedicated to Nuke, Maya and Houdini scripting. I found it helpful and dependable when some random incompatibility error occurs I know where to look and how to fix them. Then I installed PySide2. According to VFXPlatform, PySide2 started being industry standard from 2016. Since then, I believe that the visual effects industry completely shifted to it. However, some old tutorials on the internet use PySide and give an error regarding QtWidget. 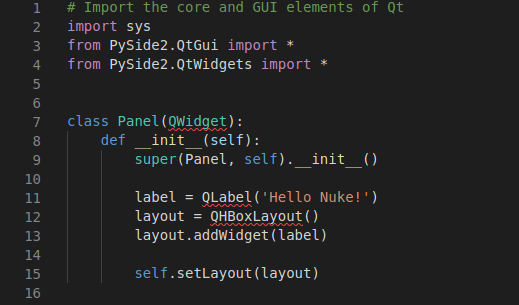 In PySide, QtWidget can be imported from QtGui class. But that is not the case for PySide2. Here you need to import PySide2.QtWidgets. Another issue related to PySide2 was rather funny. Somehow VSCode was not recognising PySide2 objects in its editor. It imported a whole PySide2 module and run a code successfully. Unfortunately, it was saying PySide2 objects are not imported and showed undefined-variable error everywhere. Well, no one likes to see red underlines below their code. Do they? As I could not think of any solution since the code works and PySide2 installed correctly, I switched to PyCharm community edition. I think it is only for python2 and hope VSCode will be fixed after a few updates. For now, I use whatever gets a job done. Next fun task was using Nuke as a module. We need auto-complete and function annotations when we develop a script for Nuke. There comes a very helpful script: Nuke-Stubs-Generator. Now I can put it anywhere you need. Realistically, I would have a bunch of scripts and tools that I am working on. But that implies that I would end up putting it in multiple places in order to use external IDE for writing scripts for Nuke. You know that it is bad practice. That way I do not have to copy it in a few places and can import nuke globally anywhere I would like to use. Of course, I have to activate the virtual environment in order to import it. So that basically wraps up how I set up Nuke scripting environment. Now it is time to write cool GUIs and pipeline scripts.